Penelope Umbrico examines the volume and ubiquity of images in contemporary culture. She uses various forms of found imagery—from online picture sharing websites to photographs in books and mail order catalogs--and appropriates the pictures to construct large-scale installations. "My focus on collective practices in photography has led me to examine subjects that are collectively photographed," Umbrico says. "I take the sheer quantity of images online as a collective archive that represents us--a constantly changing auto-portrait." 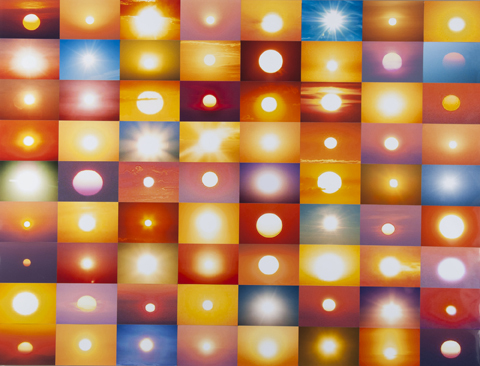 Umbrico’s "7,626,056 Suns From Flickr (Partial) 9/10/10" (2010) is an assemblage of numerous pictures that she found on the image-sharing website, Flickr, by searching for one of its most popular search terms: sunset. Umbrico crops the original files and creates her own 4x6 inch prints on a Kodak Easy Share printer. She then clusters the prints into an enormous array, underscoring the universal human attraction to capture the sun’s essence. The title references the number of results she received from the search on the day she made the work: the first version of the piece created in 2007 produced 2,303,057 images while this version from only three years later in 2010 produced 7,626,056 images. Shifting from vernacular imagery, Umbrico turns to the masters of photography in her series "Mountains, Moving" (2012-ongoing). For this series she appropriates the motif of the mountain from Aperture’s Masters of Photography publications, drawing on images from Edward Weston, Wynn Bullock, Henry Cartier-Bresson and Manuel Alvarez Bravo, among others. The impenetrable appearance of the mountain becomes just the opposite through Umbrico’s digital algorithms, which are fragmented and change with each iteration. 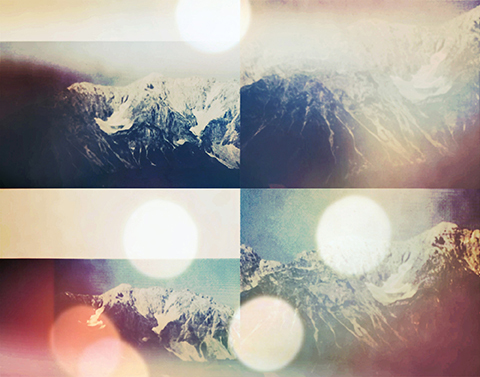 Umbrico re-photographs the mountain images using her smart phone and various filters available from apps. Many of the apps she uses mimic analogue photography, creating the illusion of light leaks, chemical burn effects, discoloration or blemishes--mistakes that may occur when using analog film, but seem absurd in the digital realm. Although she creates new pictures, it is important to Umbrico that the original photograph remains identifiable, thus offering a view of the history of analog photography through digital processes. Penelope Umbrico graduated from the Ontario College of Art and Design in Toronto (1980), and completed her MFA from the School of Visual Arts, New York (1989). She has received numerous awards and grants, including the John Smithsonian Artist Research Fellowship (2012), the John Simon Guggenheim Memorial Fellowship (2011) and the New York Foundation of the Arts fellowship (2002). Umbrico has participated extensively in solo and group exhibitions worldwide, at venues such as the Los Angeles County Museum of Art (2017); Museum für Kunst und Gewerbe,Hamburg, Germany (2015); Aperture Foundation, New York (2012); Foto Museum, Antwerp, Belgium (2012); Photographer’s Gallery, London (2012); PS1 Contemporary Art Center, New York (2009); and San Francisco Museum of Modern Art (2009/2010). Her work is part of numerous public collections, including the John s. Guggenheim Museum, New York; International Center of Photography, New York, Museum of Modern Art, New York, NY; Metropolitan Museum of Art, New York; Museum of Contemporary Art in San Diego; San Francisco Museum of Modern Art, CA; Orange County Museum of Art, CA; Museum of Fine Arts, Houston, TX; and Minneapolis Institute of Art, MN. She teaches in the MFA Photography, Video, and Related Media Program at the the School of Visual Arts in New York City, NY.